The Reserve Bank has kept interest rates unchanged at 1.5 per cent at its final meeting for 2018 on the back of mixed economic developments in November. Positive signs for the economy included a pick-up in wages growth, stronger business investment plans for 2019, low unemployment and an agreement between the US and China to temporarily stop the imposition of new tariffs. On the other hand, there were some signs of weakness: construction activity and bank lending declined, house prices kept falling and global economic growth forecasts were revised down. Despite these mixed signals, the RBA remains optimistic about the outlook for the Australian economy. The RBA maintained its key line that “further progress in reducing unemployment and having inflation return to target is expected, although this progress is likely to be gradual”. In a recent speech, the RBA governor stated: “The probability of an increase in interest rates is higher than the probability of a decrease” and that if the economy evolves, as the RBA has forecast, then “at some point it will be appropriate to raise interest rates”. So if the RBA forecasts of higher inflation, unemployment falling below 5 per cent and continued strong GDP growth eventuate, it will look to increase rates in the second half of next year or early 2020. However, the possibility remains that higher bank funding costs will push up lending rates in 2019 even if the cash rate remains unchanged (and the financial markets predict that the next cash rate increase won’t occur until 2020). The Wage Price Index, the best measure of wages growth, increased by 2.3 per cent over the year to September, the fastest annual growth since March 2015. Wages including bonuses also increased more strongly than in recent years (see graph). Stronger wage growth is welcome after years of subdued growth caused by a combination of increased concerns about job security due to globalisation and technological change, and elevated unemployment and underemployment. If stronger wage growth continues, this will contribute to higher inflation and will make the RBA more likely to increase interest rates. New bank home loan lending has declined over the past year as banks tightened their lending criteria in response to actions by the banking regulator and as banks became more cautious in their lending due to the spotlight of the royal commission. In addition, property investors have become less willing to borrow as prospects for capital gains have diminished. New bank home loans (to investors and owner occupiers) in September were 14 per cent lower than a year ago. New lending has fallen most dramatically in NSW, Victoria and Western Australia, particularly for investors. In 2019, banks and potential borrowers should adjust to the new environment of stricter lending standards and greater scrutiny of income and expenses, but there is also a possibility that the royal commission’s findings will result in banks further tightening lending criteria, which would weigh on property prices. At a meeting following the G20 summit in Buenos Aires, China and the USA agreed to stop the imposition of new tariffs for 90 days while they negotiate a comprehensive deal on trade, cyber security and intellectual property. The US had previously planned to increase tariffs on a range of Chinese imports from 10 per cent to 25 per cent on 1 January 2019. The prospect of a trade war between the world’s two largest economies was a major risk to Australia’s economy and is a situation the RBA is still very concerned about, despite the recent halt on tariff impositions. In today’s decision, the RBA stated that there have been “some signs of a slowdown in global trade, partly stemming from ongoing trade tensions”. However, while the G20 agreement is only temporary, it is a promising sign that the US-China relationship has scope to improve. 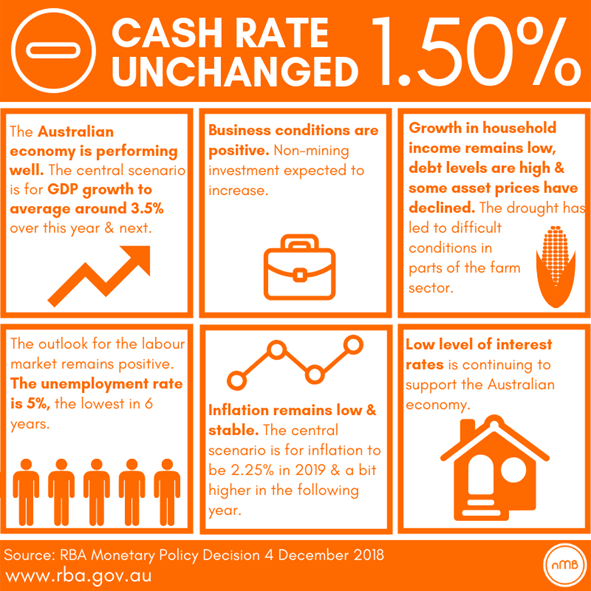 The RBA has not moved the cash rate since August 2016 and all indications are that the cash rate won’t be moved for a while yet. The RBA board now takes a summer holiday, with the next meeting on 5 February 2018.